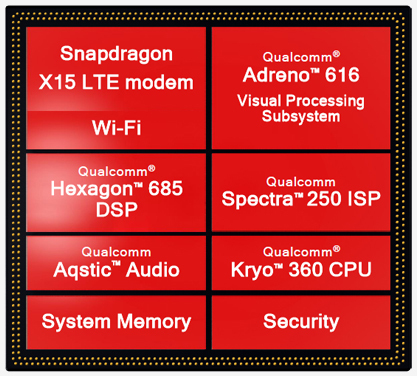 The Qualcomm Snapdragon 660 mobile platform was touted as Qualcomm’s most powerful 600-tier platform ever. It was launched to meet the needs of the upper mid-range mobile phone market. Although Qualcomm managed to bridge the gap between mid-range devices and flagship smartphones with the 660 mobile platform, it wasn’t very well received by smartphone manufacturers. With the Snapdragon 710, Qualcomm launched a new series of mobile platforms that are exactly between the flagship SoCs from the Snapdragon 8xx series and the mid-range chipsets from the Snapdragon 6xx lineup. The Snapdragon 710 is aimed at upper-midrange handsets that offer great performance at a price that is not as high as that of flagships. So, how different are the two chipsets? Let’s find out in our Snapdragon 710 vs Snapdragon 660 comparison. The Snapdragon 660 is made using Samsung’s 14nm LPP FinFET process while the Snapdragon 710 is made using the Korean giant’s 10nm manufacturing process. This makes the Snapdragon 710 more power efficient and gives the heat control and overall performance a boost. The Snapdragon 660 chipset has the Kryo 260 CPU with independent power and energy clusters designed to optimize for a better user experience. Compared to the previous processors in the 600 series, the 64-bit ARM Kryo 260 cores reduced the latency and improved the task-sharing capacities. The Kryo 260 cores comprise of four Cortex-A53 ‘efficiency’ cores clocked at 1.7GHz and four Cortex-A73 ‘performance’ cores clocked at 2.2GHz. On the other hand, the Snapdragon 710 SoC has a cluster of eight Kryo 360 CPU. Two of the BIG cores are clocked at a frequency of 2.2GHz and the remaining little cores are clocked at 1.7 GHz. The Kryo 360 CPU is based on ARM’s Cortex-A75 CPUs. The Snapdragon 710 is nearly 20% faster than the Snapdragon 660. The Snapdragon 660 has the Adreno 512 GPU, while the Snapdragon 710 has the new Adreno 616 GPU. It has a 5% performance improvement over the Adreno 512. This will enable users to play heavy games and 4K HDR easily. 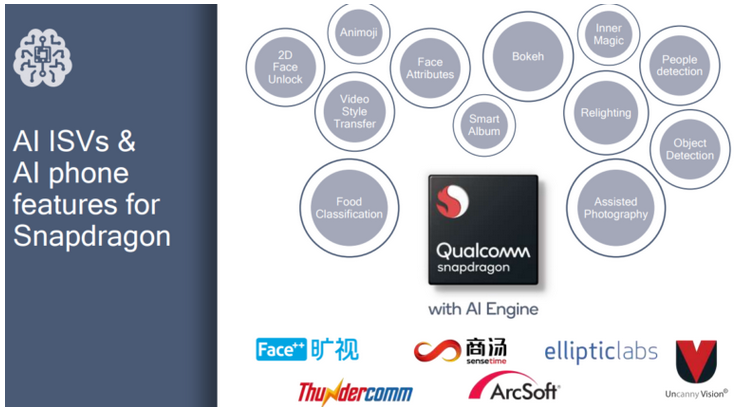 The AI Engine hardware of Snapdragon 660 comprises of a Hexagon Vector Processor, Kryo CPU, and Adreno GPU. 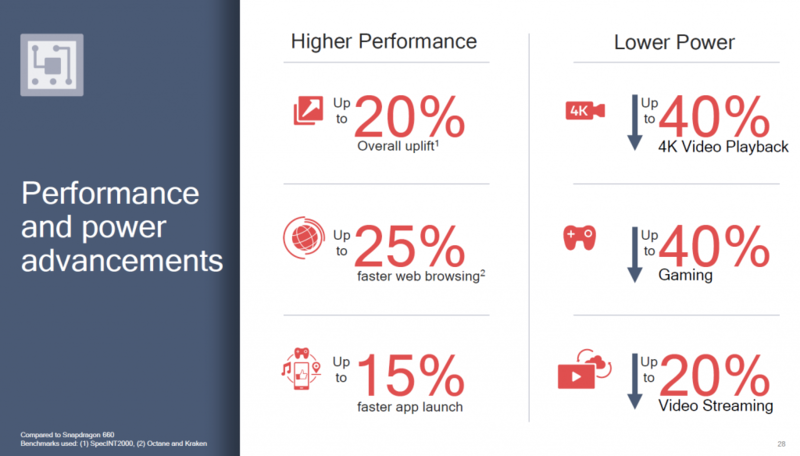 Even though the Snapdragon 710 doesn’t have a dedicated neural processing unit, it has a multicore AI engine and a Neural Processing Engine (NPE) which offers up to two times better performance in AI apps, compared to the Snapdragon 660. The Qualcomm Adreno Visual Processing subsystem, Qualcomm Hexagon Vector Processor, and the Kryo CPU work in concert to make up for the dedicated neural engine. 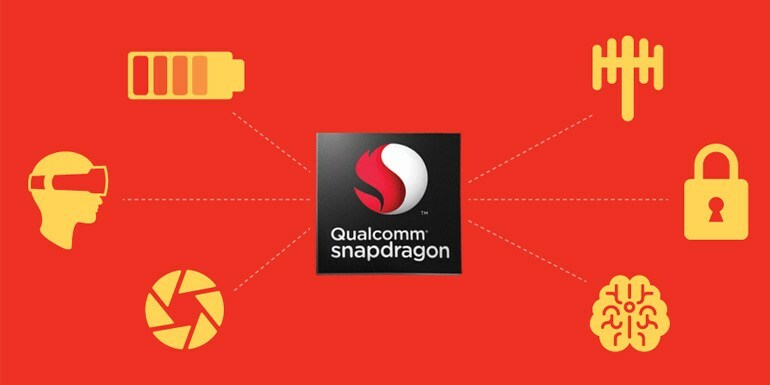 The Snapdragon 660 comes with Snapdragon X12 modem while the Snapdragon 710 has the latest X15 modem, Qualcomm’s 5G modem. The X15 modem can achieve download speeds of up to 800 Mbps and it is capable of upload speeds of up to 300 Mbp. COmparitively, the older X12 modem offers download speeds up to 600 Mbps and 150 Mbps. The 710 also has other components such as LAA (License-Assisted Access) and 4X4 MIMO. All this will enable the 710 to offer connection speeds similar to the 845. The Snapdragon 660 has the 14-bit Qualcomm Spectra 160 ISP which supports capture of up to 25 MP with zero shutter lag. The 710 has the 14-bit Qualcomm Spectra 250 ISP which supports capture of up to 32 MP and video capture up to Ultra HD 4K. The Spectra 250 ISP is great for low-light images. It also supports HD Video capture and is 40% more power efficient. The Spectra 250 ISP can take flagship quality images. 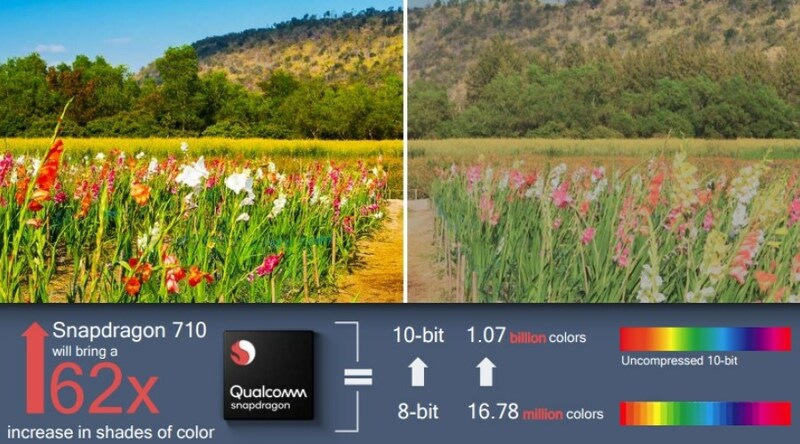 Basically, the Spectra 250 of Snapdragon 710 belongs to the same generation as the Spectra 260 of the Snapdragon 845, which means it can achieve the image quality seen on flagships like the Galaxy S9. However, it will largely depend on how the manufacturers tap the image processing power of the processor. The Snapdragon 710 isn’t merely an upgrade over the Snapdragon 600 series, it is a completely new type of product that can redefine buying habits. The new processor has outdone the Snapdragon 660 in all the arenas. Even though the Snapdragon 710 looks like a good mid-range chipset on paper, in reality, it’s like an affordable high-end processor and has many borrowed many features from the Snapdragon 800 series. Even though the Snapdragon 600 series offered great value for money, there was a large performance gap between the 600 and 800 range of chips when it comes to performance per clock cycle, image processing, and network speeds. That’s where the Snapdragon 710 comes in. It has been manufactured to offer flagship-level performance without the flagship price tag. In many ways, it could be called the 845 lite. It is made on the same 10nm process as the 845, which means it is very power efficient. It offers better battery life than the Snapdragon 660. 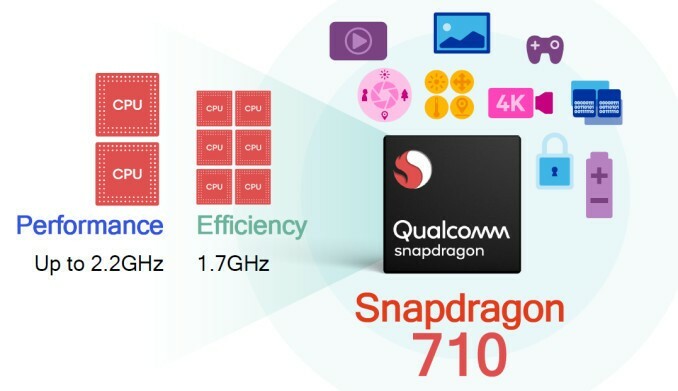 The Snapdragon 710 has a BIG.little CPU configuration with the same powerful cores as the 845 paired with efficiency cores based on the A55 CPU design. The chip has a 685 Hexagon DSP, a 600 series Adreno GPU, X15 LTE modem, and a 200 series Spectra ISP. It is surprising to see such components on a mid-range chip. The Snapdragon 710 offers some important upgrades over the Snapdragon 660. The pictures will be comparable to those taken from flagships such as the Samsung Galaxy S9. 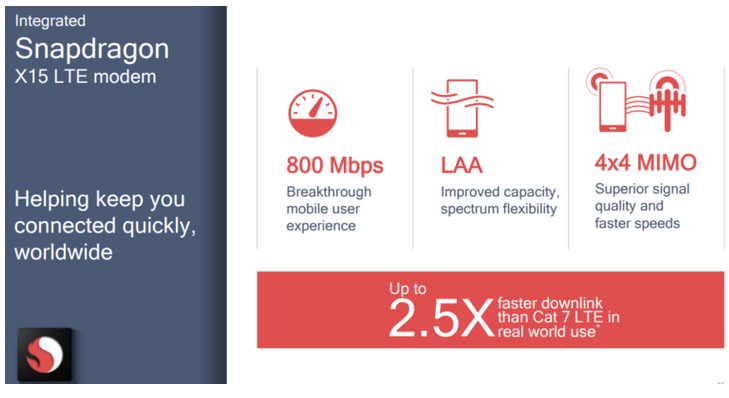 Modem features such as LAA (License-Assisted Access) and 4X4 MIMO will offer better data speeds. Most importantly, the Snapdragon 710 will enable manufacturers to make flagship-level smartphones that won’t cost a thousand dollars.